· ✈ DANCE MODE: Preset various action commands through the app and the mini drone will fly following the commands along with the music effects. 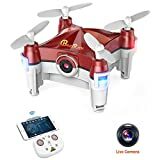 · ✈ HD WIFI FPV CAMERA: connect your phone with the drone and the view will be displayed directly on your phone, enjoying the world in a different way. · ✈ LED LIGHT: With a bright LED reflector, users can fly the drone in the dark night easily. · ✈ HEAD FREE MODE: Prevent the drone from accidentally escaping due to lack of orientation and make it easy to fly and control. · Features: Mini drone folding design, portable and easy to carry. 3 speed modes, a good quadcopter for beginners and can operate easily and consistently in any condition. The 2.4G transmitter for easy control, and the latest 6-axis flight control system, provides super stable flight. With a key button, you can get 360 degree flips for perfect action and wonderful performance. CONNECTION: Wi-Fi connection to mobile camera and 480P Specifications: Item size: 40 * 40 * 35 mm Weight - 23 g / 0.81oz R / C Distance - 20m WIFI Range - 20 m Charging method: USB Charging time - 20-30 minutes Flight time - 4-5 minutes USB charger: Standard only + 5 + 0.5V Package: Quadcopter * 1 (includes 1 * camera, 4 * blades Main) Transmitter * 1 (battery excluded) Additional Main Blades * 12 Blade Wrench * 1 USB Transmitter Charging Line * 1 Airplane Battery USB Charging Line * 1 User Manual * 1 High Quality Customer Service Always with you, feel free to contact us with any questions or concerns. Giving the best customer experience. Warranty and support One year warranty from Beebeerun. 90 days money back guarantee.